Former champion jump jockey Richard Dunwoody says the memory loss he suffers could be a result of falling "hundreds of times" in his career. Dunwoody, 52, is among the first volunteers for a research project examining the long-term effects of concussion on competitors in sports. "I lose my track and lose my memory," he told BBC Radio 5 live. "I don't know whether it's old age or whether it's a result of concussions. I had about 700 falls." Read more: What is concussion? 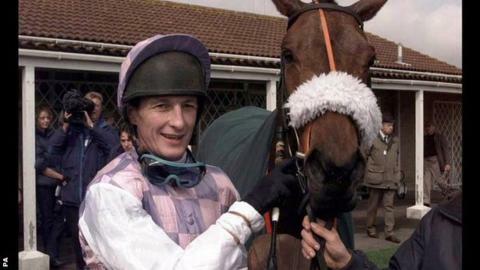 Belfast-born Dunwoody, who won the champion jockey title three times in a 17-year career ended in 1999 by a neck injury, added: "Of those falls, I was reasonably concussed seven or eight times. "I either woke up in the ambulance room, on the racecourse, in a sauna or somewhere else, and had quite bad memory loss. "My father was a jockey. He fractured his skull and had Alzheimer's towards the end of his life. "He did live to 91 so it might have been just old age, but the more we can find out from this study the better. "Are we as jockeys more susceptible to neuro-degenerative diseases or not?" The study, Concussion in Sport, wants to establish whether retired sportsmen and sportswomen have an increased incidence, or suffer an earlier onset, of neuro-degenerative disorders. The British Horseracing Authority, which has welcomed the research project, is already reviewing its own practices around concussion. Funding and support for the study, which will then extend to all sports in which concussion is a recognised risk, has come from a range of sources, including the Injured Jockeys' Fund, racehorse owners Godolphin, American football's NFL.